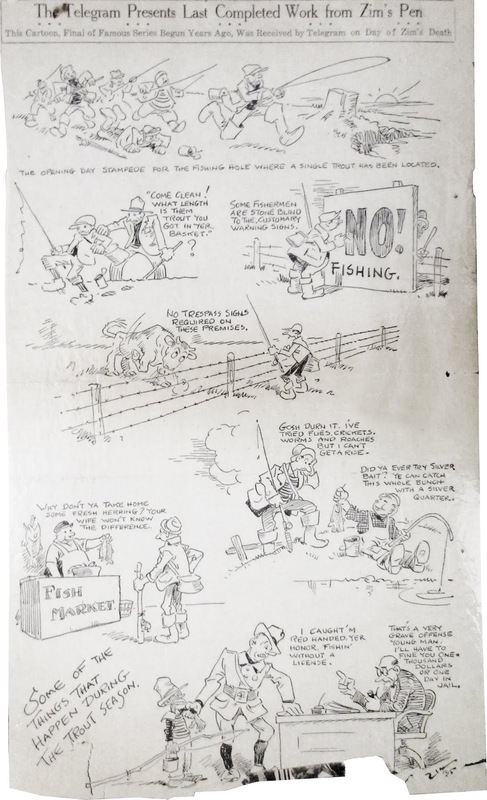 Eugene “Zim” Zimmerman’s last finished cartoon arrived at the offices of the Elmira Telegram on the morning of his death on March 26, 1935. 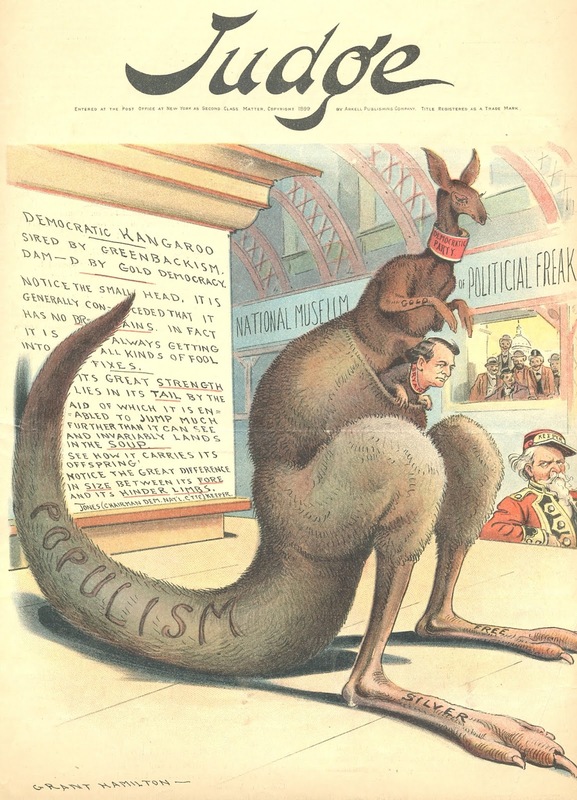 He had begun his career as a political cartoonist in 1883 working for the satirical magazine, Puck. He jumped ship for rival publication Judge in exchange for higher pay in 1885. Judge was decidedly pro-Republican and for the next 28 years Zim made his money lampooning Democrats. Even after he retired, he continued to draw political cartoons for local and national publications. At the time of his death, he still had a partially finished drawing of a political cartoon sitting on his easel. The drawing shows Uncle Sam being upset by the discordant stylings of Huey Long, Father Coughlin, and “Johnson.” By their nature, political cartoons are incredibly timely. If you don’t know the people in it, you won’t get the joke and, if you’re anything like my coworkers and I, you probably don’t get this one. Knowing the players is key. Huey Long Jr. (1893-1935), also known as “The Kingfish” was a Democratic senator and former governor from Louisiana. As part of a presidential bid, he proposed a series of radical populist plans to redistribute the nation’s wealth. He was assassinated on September 10, 1935, several months after Zim drew his cartoon. Father Charles Coughlin (1891-1979) was an influential radio personality and Catholic priests whose listeners numbered upwards of 30 million. Although initially supportive of the New Deal, by 1935 he regularly railed against it and painted Roosevelt as a tool of the banks. His populist rants were anti-Semitic, anti-capitalist, anti-communist, and pro-fascist. He is widely considered the father of talk radio. Even after an hour’s research, I could not figure out which Johnson the one in Zim’s cartoon is supposed to be. Still, I think we can make an educated guess about what Zim was getting at: populism bad. I wonder what he’d say about today’s politics. 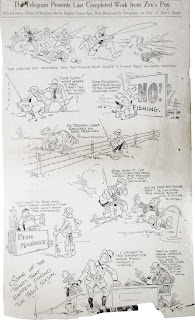 Zim’s final cartoon and other works will be on display at the museum from April through October 2019 as part of the exhibit From Pencil to Page: Eugene “Zim” Zimmerman’s Creative Process. Come check it out! Spring seems to be arriving at last. Things are looking greener, and there’s new interest in tidiness sparked by recent books and television programs on organizing. I’ve been wondering about cleaning tools, take brooms for instance. The word broom comes from the Anglo-Saxon for thorny shrub, and early brooms were just that, hand-made from twigs gathered together and tied to a stick. 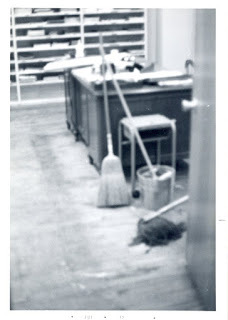 As a cleaning tool, similar brooms have shown up around the world. In parts of Asia, Han Chinese recognize Tomb Sweeping Day in early April. This 2,500-year-old holiday involves ritual cleaning as a sign of ancestral respect. Another sweeping tradition comes from Africa, where various cultures continue to sweep fenced-in areas in front of their homes as a proud sign of ownership. Having a well-swept yard invites good will and neighbors to visit. Bringing this tradition with them to the United States, enslaved Africans continued the practice. It’s a tradition that fit easily into the warmer southern parts of our country. Sweeping created an inviting outdoor space for people who had very little to call their own. A swept yard also eliminated worry of weeds and eliminated the impracticality of caring for a lawn. Patterns left in the dirt by sweeping, besides looking nice, were a helpful way to see if any snakes or undesirable elements had disturbed the area. Inside houses, smaller versions of brooms were regularly used to sweep ash, embers and debris near fireplaces. Benjamin Franklin brought sorghum to the new colonies in 1757 intending to use it to make better brooms. 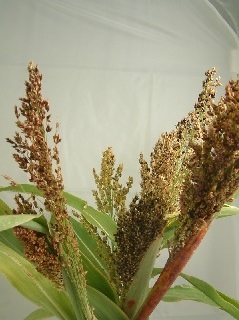 Sorghum corn is now called broom corn and while technically edible, it’s really a grass not a variety of corn. Forty years later, a Massachusetts farmer named Levi Dickinson made changes which improved the quality of brooms. Wanting a gift for his wife, he bundled just the tops of sorghum tassels and attached them to a long-handled stick. With her new broom, Mrs. Dickinson could sweep cleaner. Word of her cleaning tool’s success spread and created demand for bundled sorghum brooms. Understandably, these finer brooms didn’t last, falling apart easily. Dickinson addressed this by inventing the foot-treadle broom machine, a device letting him make brooms faster. In less than ten years, Dickinson and his son were selling hundreds of similar brooms around the country. This broom from our collection would be a similar to Dickinson's broom. The brush strands have been gathered into a bundle and tied to a stick. Broom from our collection, n.d.
One of the last big changes in broom design occurred before the turn of the 19th century. The Shakers, a religious sect known for their beautiful craftsmanship and practical design of everyday items, started adding wire to secure the bristles creating a sturdier broom. They also invented a broom vise to flatten the brush. Up to this point, all brooms had been round. Using these flat brooms look familiar to us today. Sweeping with this kind of broom, a user was able to sweep those pesky hard to reach places. This kind of broom was also easier to store because it took up less space. 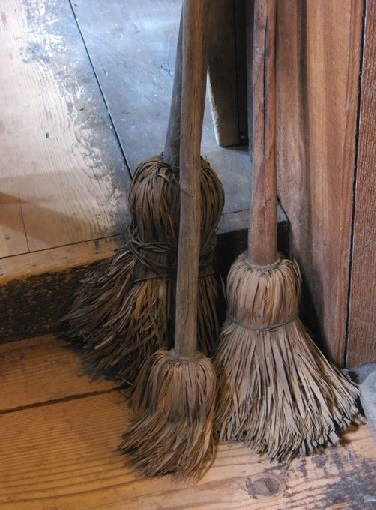 By the 1830s there were over three hundred U.S. broom manufacturers producing close to 60,000 brooms a year. Less than twenty years later over a thousand broom manufacturing businesses were thriving and located throughout the Eastern United States. By the beginning of the twentieth century, motorized vacuums began to be popular. 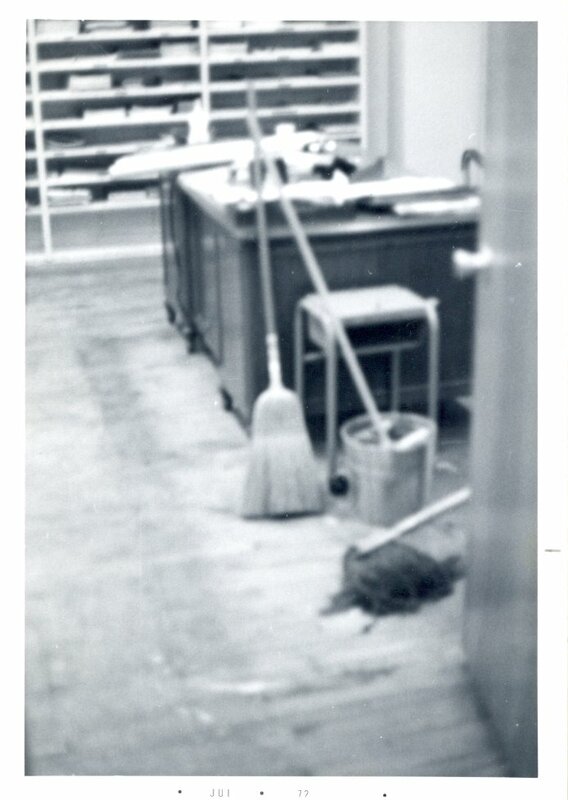 The broom boom subsided, and by the 1960s most of the country’s broom manufacturers closed. Now most brooms are imported and made from synthetic materials. There is a new interest in heritage craft broom making and these brooms cost more. Brooms are something everyone seems to have at least one of, somewhere. 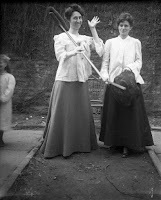 This last picture from our collection, shows how handy brooms can be. Time to find mine.